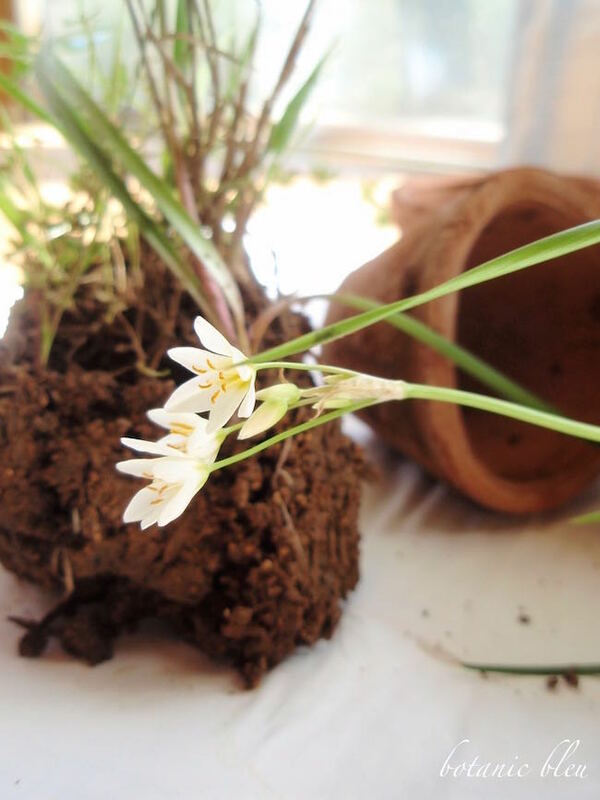 Others look familiar like these white Crow's Poison that grow from bulbs and fool some into thinking they are wild onions. Crow's Poison is mildly toxic if eaten and should not be ingested. Hundreds of them grow throughout our yard and woods. Each Spring they return. 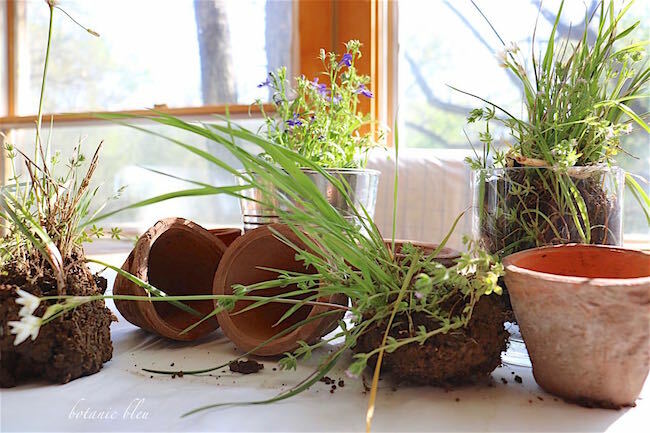 After buying wheat grass for an Easter basket, I decided to dig up some of these wild flowering grasses to pot in small rustic clay pots. 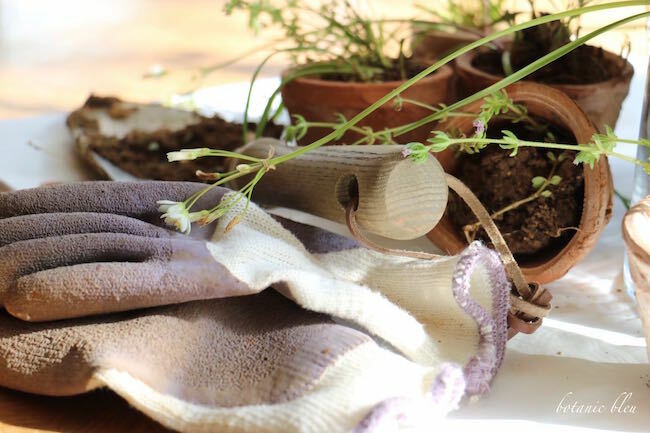 Do you have the urge to dig in the dirt each Spring, also? A large pad of graph paper, 17" x 22", from the office supply store works nicely to protect the breakfast table from the soil, from moisture, and from scratches from the clay pots. When the top sheet gets dirty, a new clean surface appears by tearing off the top sheet. The pad's thickness keeps water from soaking through to the wood table. 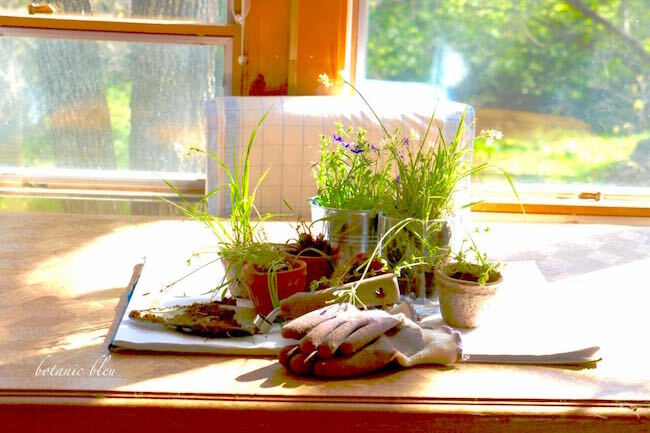 The pad is great for all kinds of projects that are messy from painting to gluing to potting. 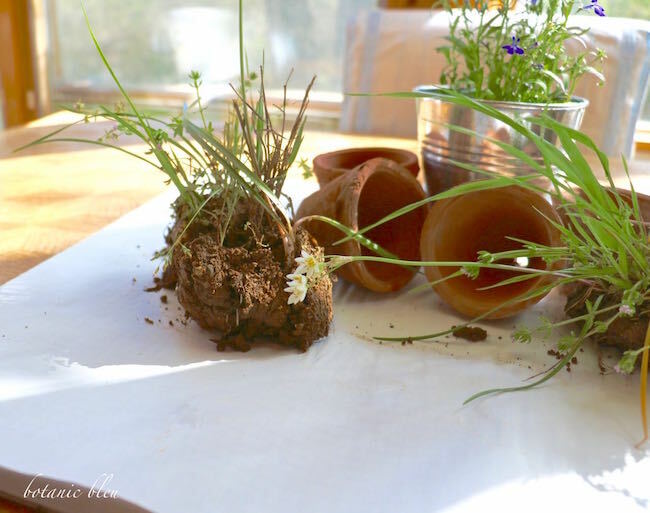 The pots can only hold small amounts of the flowering grasses with soil surrounding their roots. 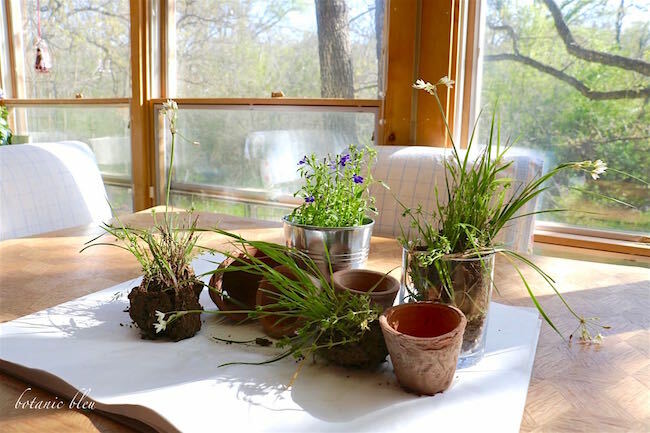 Since the wild grasses' flowers are small the size of the pots are in proportion to them. Bigger pots would overwhelm the small flowers. 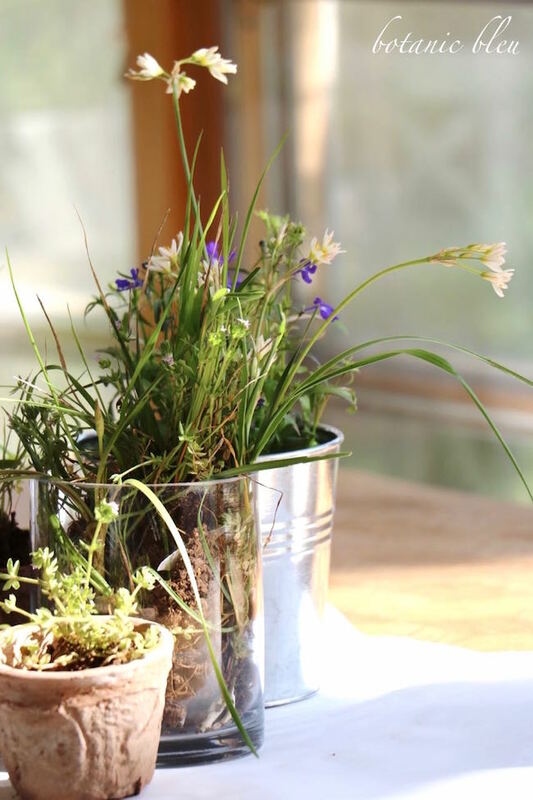 A larger clump of mixed grasses, Crow's Poison, and the tiny purple flowers fits inside a clear flower vase that allows the plants' root systems to be visible. This close view of the wild grasses lets us see the many small flowering grasses growing mixed together. The blue lobelia plant in the metal container is not a wild, native plant, but is a bedding plant from the local nursery. Many people love large showy cultivated flowers like hydrangeas, peonies, and roses, (myself included), but there is something about wild, straggly, native plants that speaks to my country roots. 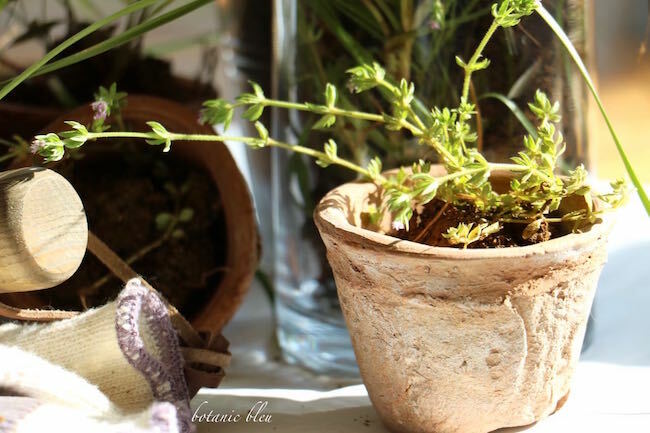 These sturdy little plants survive year-to-year without any extra loving care. 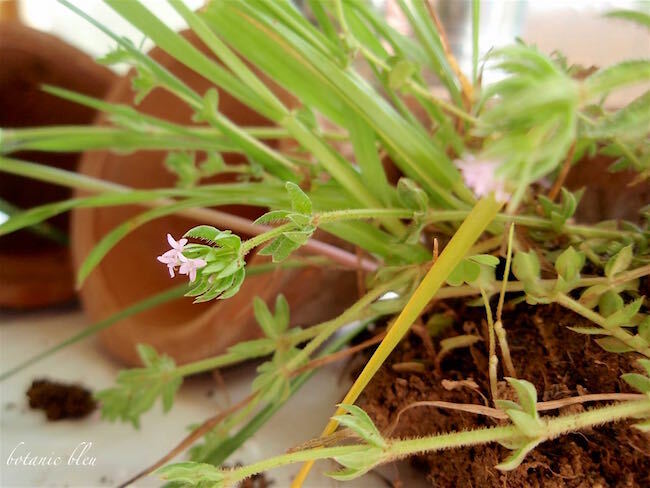 Do you know the name of this tiny grass/wildflower? After hours of searching online sites for Texas grasses and wildflowers, I was not able to identify this little plant. Many wildflower online sites include pictures and information about Crow's Poison which grows all across the Southeast. All finished! 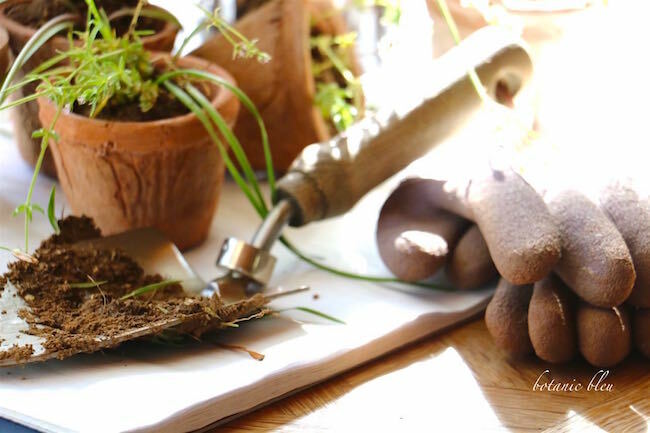 See how I used these little pots of wild grasses/wildflowers in my next post. Any guesses? Have you been digging in the dirt at your house? 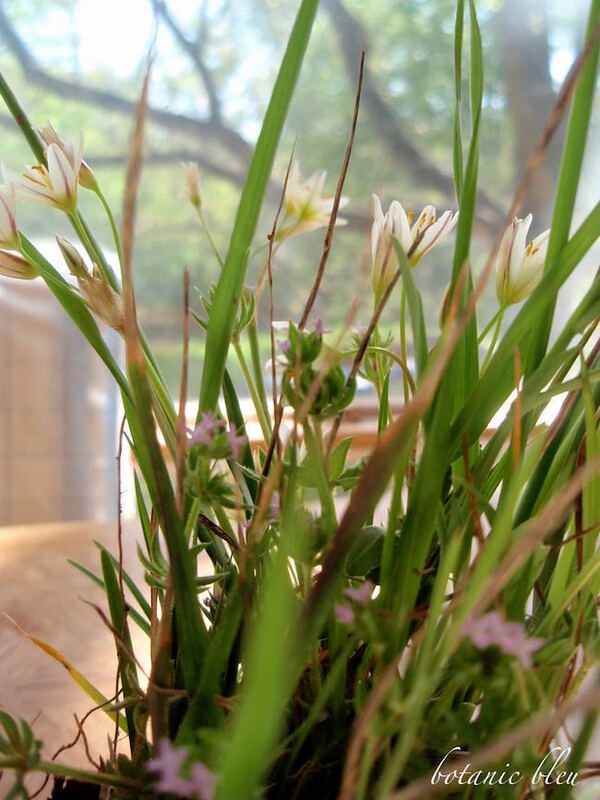 Do you have any grasses or wildflowers that speak to your country roots? Okay. 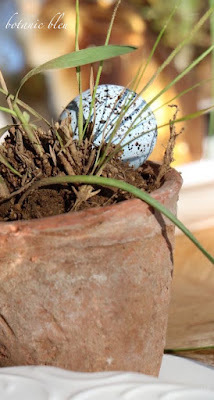 Here is a little peek at the next post that suggests how I used these little pots of wild flowering grasses. Any guesses now? Fascinating natural beauty incorporated into your Easter decor. 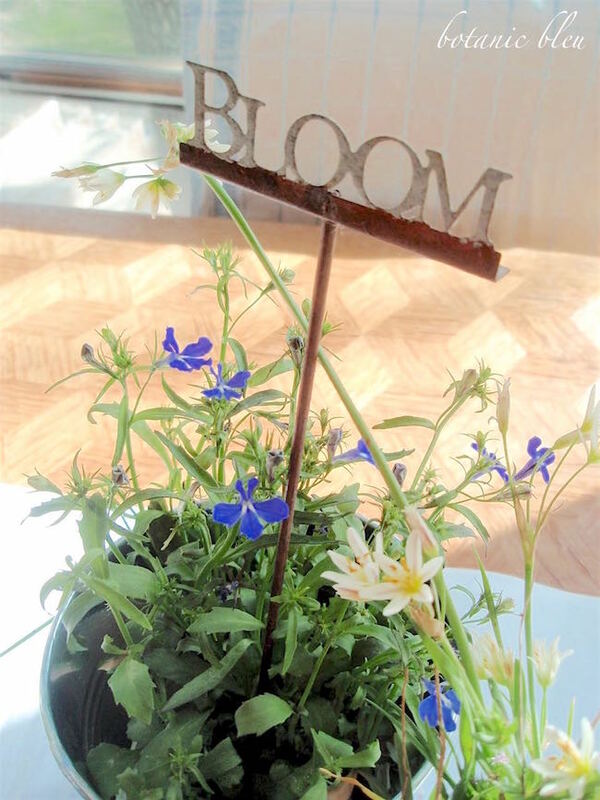 Your point is well taken about enjoying and incorporating those scraggly wild grasses and flowers into our container gardening. Pinned. Yes, I have been in the garden daily and loving each windy moment-sad to say we had a frost and I was ill-prepared. Love these. The robins arrived yesterday, and now we're getting a blizzard, so spring is all over the place at my house. Lovely to see something green & blooming at yours, Judith! Your touches of Botanic Bleu are breathtaking. That one color amidst the rest stands out to attention. WELL DONE! Good morning Judith. Your grasses are so pretty and I must say, you are rocking your photography! Beautiful. I've never considered potting wild flowers. I will now! Making an Easter mantel perhaps?